A good safe protects not only your valuables, but also your peace of mind. These safes are designed to protect your valuables and documents from theft and fire. For more information about home safes, read Home Security Safes. To protect your firearms, please visit our Gun Safes page. Sportsman Steel Safes is the only safe manufacturer who cuts out the middlemen, and passes the savings on to you. Safe dealers demand cheap prices and other manufacturers create a safe which reflects that price. We sell safes directly to you at prices 20% to 50% lower than other safe manufacturers and provide a higher quality safe — No tricks or mirrors — just good marketing strategy. Champion Safe is dedicated to bringing our customers the best gun, office, and home safes in the United States. For more than 30 years the Graffunder family has put their name and reputation behind every hand-crafted gun safe and security product they manufacture and sell. We have been providing safes and security solutions to the banking industry since 1948. This type of high security technology is built right into our gun safes. Before the American Security name is attached, each safe must undergo a rigid 28-point inspection. We produce over 60,000 safes each year and we take protecting our customers’ assets very seriously. That’s how we got to be the largest security safe manufacturer in the world, and that’s why you can’t buy a better gun safe than an American Security safe. As a family-owned, hometown business, Heritage Safe Company knows the value of preserving and protecting the things you hold dear. We have built our business on securing your irreplaceable possessions and protecting your heritage. At Heritage Safe Company, we take pride in every safe manufactured. Heritage Safe continues to set the standard in home security, fire protection, value and elegance. Stack-On Products Company is a leading manufacturer of top quality Tool Storage Systems, Accessories and Security Cabinets. Since 1972, Stack-On has supplied a wide and diverse line of tool storage products to meet the needs of mechanics, maintenance personnel, trades persons, homeowners and hobbyists throughout the world. We believe a home gun safe is a permanent investment. Security is part of our promise to you: We believe you should have real security at an affordable price, quality in all aspects of the product, as well as a lifetime warranty that means you are actually protected from fire, flood, attempted break-in, break-in and manufacturing defects. As a Cannon Safe owner, you also have access to knowledgeable service technicians with the authority to fix any Cannon Safe issue on the spot. Burglary resistant safe with digital electronic locking system with reprogrammable combination. Approximately 1.06 cu. ft. of storage capacity. Can be bolted to the floor or wall. Emergency override key included. Dual live bolts. Made of heavy gauge steel. Shelf and anchor bolts included. Brink’s Home Security Biometrics digital steel fire safe with Touch n’ Open Fingerprint technology. Protects valuables during a fire up to 1700 degrees for one hour. One master user ensures security with up to 10 fingerprints programable. Our dry-fill guarantee ensures there will never be any mildew build up in the interior of the safe. Approximately 1.2 cu ft of storage capacity protected by dual LCD digital lock with a key lock for added security and manual over-ride feature. Each live bolt has an independent fly wheel. Safe is constructed of all solid steel components. Brink’s Home Security safes have a 5 year limited warranty. There is lifetime after-fire replacement. Fire-Safe Model S0491 Safe. Manufacturers lifetime after-fire replacement guarantee. One-hour UL fire tested. Includes one adjustable shelf, built-in key rack and door compartment, bolt down kit, and backup key lock. Dual locking mechanism for added security. Personal size, water-resistant safe. Holds A4 size paper. Four-number changeable combination lock. Optional Storage Tray (SEN901), sold separately. This security lock box is designed to protect, secure and organize valuable and irreplaceable documents and possession. A tubular key-lock provides privacy in daily use and prefects the lid from opening in the event of a fire. This security box provides peace of mind for families who want fire protection (1hr. UL classified) for basic documents (birth certificates, wills, passports, deeds, insurance papers, etc.) without the continuing expense and inconvenience of a safe-deposit box. A water-proof seal that is ETL verified provides extra protection for contents. U.L. classified two hour proven fire protection. Water resistant. Four number changeable lock and tubular key lock. Six live locking bolts secure door. Key rack, door pocket, door compartment for small items, large locking drawer and multi position shelf. Manufacturer’s $30,000 fire protection guarantee. Can be bolted to floor (hardware included). $30,000 fire protection guarantee. Safe protection for your valuables doesn’t have to be expensive! 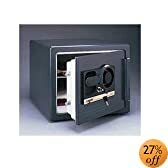 This 9 1/2″W x 7 1/4″D x 11″H safe features both a 3-number combination lock and a keyed-entry, so you can enjoy both security and convenience. Pre-drilled mounting holes make in-wall or surface attachment simple and secure. A built-in shelf provides added storage options. Contractors: you won’t find a less expensive residential add-on that will attract more buyer appeal. Do you feel safe in your home or neighborhood? Have you thought about having a hand gun in the house for protection, but dont want your kids to get a hold of it? Gun ownership comes with many responsibilities, but now youll have one less to worry about. This hand gun safe is the perfect place to store your firearms without having to worry about who can access to them. This fireproof wall safe uses the latest advances in fingerprint measurement technology to quickly allow you access to your gun safe, and prevents unauthorized people from getting in. This safe is capable of reading your fingerprint in seconds which allows you quick access to your firearm, when you need it most. So if you need a hand gun in the house, do the right thing and secure your firearm with this fireproof wall safe that is Department of Justice approved for home safety. The main storage space of the home safe can accommodate approximately two hand guns, while the hidden storage compartment in the back of this in wall safe is the perfect place to ammunition and other small valuables, such as jewelry, passports, and credit cards. This fireproof wall safe is constructed of handsome 14-guage stainless steel for maximum strength and durability. The biometric sensor can store up to 6 different fingerprints scans, so you wont have to worry about loosing keys for this wall safe. Because of the fingerprint scan, you wont have to worry about your children getting a hold of anything inside. Gary Personal Safe with Bolt Down Kit for Wall or Floor. Manufacturers one-year warranty. Compact safe for home or office use. Tough solid steel construction with programmable digital keypad provides security and easy access. Can be bolted to wall or floor, includes bolt-down kit. .3 cubic foot interior capacity.